Hiro Boga holds an MFA degree in Creative Writing from UBC, where she was a Graduate Fellow from 2000 to 2002, and a B.Sc. in Psychology from the University of Oregon. 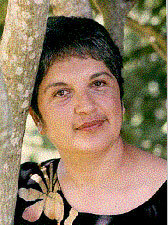 Her short story, Sunder Ayah, was shortlisted for the 2000 CBC Literary Awards. She has received awards from the BC Arts Council, the Canada Council and the Canadian Department of Foreign Affairs and International Trade. She is the Managing Editor at Oolichan Books, and has taught Creative Writing at the University of British Columbia. She has been writer-in-residence for the CBC radio program, North by Northwest, and a portfolio of her poems has been published in Red Silk, an anthology of Indo-Canadian women poets. Love Songs For A Tender God, Oolichan, 2002. Poetry. Shahnaz, Oolichan, 2000; Penguin Books, 2002. Novel.